My travels took me from Djibouti through Nairobi, Kenya where I had a few hours layover. 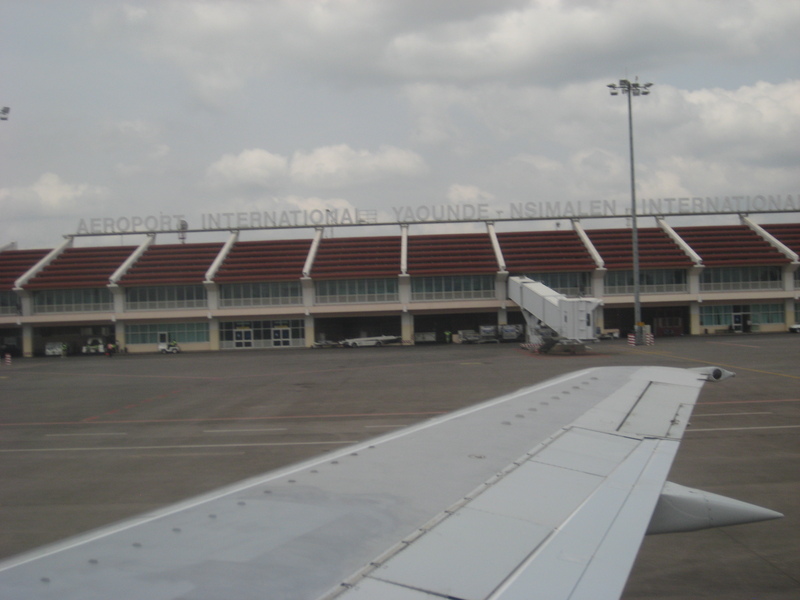 From Nairobi, I flew directly to Yaounde, Cameroon. What a dramatic difference from Djibouti!! As I get off of the plane, I feel the humidity hit me. Already, out the window of the plane, I can see that the environment in Cameroon will be very different to what I’ve become accustomed to in Djibouti. While Djibouti is arid, with not much able to be grown there outside of a greenhouse, I saw little but green, lush land for a lot of the trip from Nairobi. 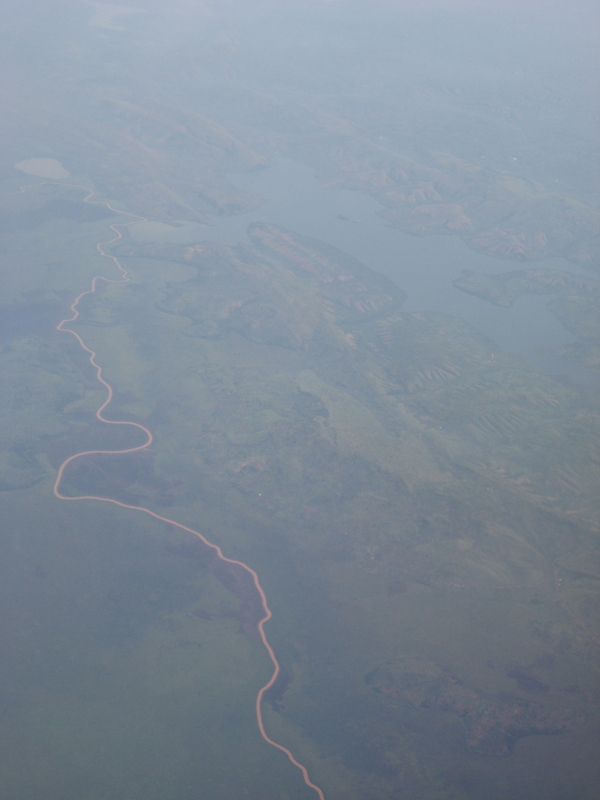 Our flight path took us over from Nairobi, over the beautiful Lake Victoria, and over many other places I have yet to visit, like Uganda, the Democratic Republic of the Congo and the Central African Republic. Part of the ride was cloudy, but I was able to see some of Lake Victoria – it’s size is really quite incomprehensible! Things cleared up a bit as we approached Yaounde, and I could see nothing but green tree-tops, with the occasional clearing where trees had been cut down, and a few rivers winding through. Kind of looked like a big sea of broccoli from above, though I suspect it wouldn’t look a thing like that from close-up! The difference between Central Africa (though Cameroon is in my West Africa Lonely Planet guide-book, it is pretty centrally located and from what I’ve gathered so far, Cameroonians consider themselves Central Africans, not West Africans) and the Horn of Africa, where I’ve been spending most of my time, is quite notable and immediately apparent. For example, Djibouti has no rainy season and only gets about 13 inches of rainfall every year, while apparently I have come to Cameroon during, where I’ve been told to expect temperatures in the 90’s and heavy daily showers, usually in the afternoons. The humidity isn’t altogether new to me, as Djibouti can be quite humid, depending on time of the year. Though it hasn’t been too bad lately, so the humidity in Cameroon is much more pronounced right now. Yaounde is a big city, and in some ways it reminded me of Addis Ababa, Ethiopia – like in size and feel. But it has a warmer feel to it, and seems a bit less chaotic. It just seems like a more laid back and friendly place than Addis Ababa. On the other hand, it also seems less sophisticated, and a somewhat more simple lifestyle seems to be the norm here. Now, this is just a first impression, and I’ll revisit this later on, after I’ve had more of a chance to see the city, as so far I’ve driven straight from the airport to my hotel, and as the conference I am participating in is in the same hotel that I am staying in, I have barely left the hotel – just one excursion for dinner. Hopefully, after we close our session this evening, some of the other participants and I will manage to find that grocery store that is close by that we’ve been told about, and we can explore the area a little bit. But so far, Yaounde strikes me as a friendly place – though I have been warned to be careful and mindful that there is crime here, particularly theft, so to be careful, particularly when considering taking a taxi anywhere. I’ll feel out the situation a little bit more, keep to the company of others (safety in numbers and all that) and get some advice from some locals before I venture ANYWHERE on my own. 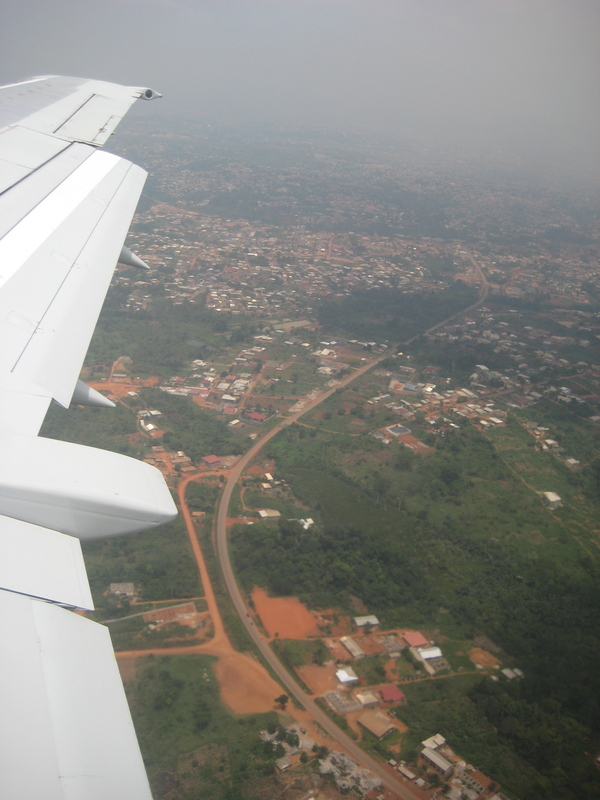 I have enjoyed all of my trips to Cameroon (3 so far) – very kind people! I will be going back one more time, and I am looking forward to it very much.